As a direct result of Matt Hale filing document 211, and the ongoing petition campaign to have President Trump commute his sentence, the USA Maximum Security Prison in Florence Colorado has severely limited Matt’s already negligible human rights. They have taken away his calls to his mother for 6 months and taken his personal property out of his cell, including his writing supplies. He is also not allowed to use the law library. And sign the petition at link below. We call the volunteers, the last of the walloon people who fought alongside Leon Degrelle. Unterscharführer Fernand Kaiser Gruber (1923-2018) from Belgium, on 16.03.2018 was recalled to the his rightful place among the heroes of his people, in Valhalla . Honor His memory, may he rest in peace. The 80-th anniversary of the Anschluss – Austria is Awaken! Today March 9, 2018 marks the 100th anniversary of George Lincoln Rockwell’s birth. The man needs little to no presentation as his achievements have been covered far and wide, not only here, but also in a host of different websites all over the Internet. One is left to wonder what would have the über-Liberal mainstream media of today done with him had he been around in such an age like the one we have been so “privileged”, as White people, to live in. I suppose he would have been literary burned at the stake by the Jewish-Marxist inquisitorial front, but one is also left to think what George Lincoln Rockwell would have done with a tool such as the Internet had he had the chance to use it. 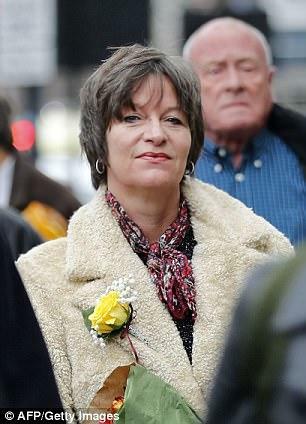 ALISON CHABLOZ ARRIVED AT WESTMINSTER COURT YESTERDAY, March 7, for the second leg of her trial for expressing views that are called “grossly offensive” because they mock revered Jewish figures like Elie Wiesel and Anne Frank. These views are embedded in songs she wrote and sang, that were uploaded onto the Internet. Chabloz said: ‘You can call it holocaust denial but I prefer holocaust revisionism. ‘I think there should be an official scientific and forensic investigation. I doubt very much that a murder case would be brought to these courts without forensic investigation. ‘It is impossible to assess that the gas chambers actually existed to kill human beings without evidence. it is impossible to affirm that the supposed murder took place. ‘As the war years continued and got harder for everybody and we see the allied bombing of the German infrastructure – why would they not bomb the concentration camps? ‘A disproportionate amount of blame was put on the Germans by the victors. The victors got to write history. ‘I would say that the so-called holocaust has been used to sustain the criminal state of Israel – it is used as a foundation myth. ‘By sending school children on trips to Auschwitz and inculcating them into believing in the gas chambers, the so-called holocaust is used as a weapon to prevent nationalistic feeling amongst European people. ‘It’s about furthering the globalist agenda. Chabloz retorted, ‘But it depends for whom doesn’t it, because there are plenty of parodies of Christian music that say Jesus was gay or that he must have been born by a donkey. Really?! A UK representative of the Court and the legal system says it is racist (wrong) to not want your race to disappear!! Things are worse than I thought. At this point there was loud booing from the public gallery and Chabloz’s barrister, Adrian Davies, rose to speak. ‘Now the witness is being treated much as a heretic during the inquisition, she is entitled to any political view that she wishes,’ Mr Davies said. He believes that the statute is poorly set out (worded). The charges centre on whether embedding the hyperlink to the footage constitutes as sending, and if her songs were grossly offensive. Chabloz was given bail again until the final submissions on 14 May and a verdict will be given on 25 May. Since a number of „establishment“ historical books written about the Waffen-SS have liberally garnished their hatchet jobs with negative letters attributed to members of the Waffen-SS. we thought that it was high time that the more prevalent positive side of the picture was given some exposure. Hence the various European volunteer letters that will appear in this and future issues of SIEGRUNEN. The letters originally appeared in the SS wartime publication: Aufbruch, Briefe Germanischer Kriegsfreiwilliger, a booklet that was translated into a number of different languages for circulation in the appropriate countries at the time. The letters seem to accurately reflect the most widely held sentiments of the Germanic volunteers and provide an interesting glimpse into the motivating factors that made the Waffen-SS into a truly international army. When Hitler’s armies were advancing across France in 1940, the Canadian government put out a story that German troops were damaging the memorial at Vimy Ridge. Walter Allward’s soaring monument had been unveiled only a short time before, in 1936, the only official ceremony (except for abdication) in the short reign of Edward VIII. A popular postage stamp was widely in circulation, so Canadians were thoroughly familiar with Vimy Ridge, and they were outraged. There was someone else who was outraged by this story; his name was Adolf Hitler. The monument at Vimy Ridge was Hitler’s favourite memorial from World War I, because it is a monument to peace, not a celebration of war. There are no carved guns at Vimy Ridge, no helmeted soldiers, no stacks of cannonballs. Instead, the figures are of Canada grieving for her lost sons. Hitler went to Vimy Ridge on June 2, 1940, called in the world’s press as best he could and insisted they take his picture on the unscathed steps. He then assigned special troops from the Waffen-SS to guard Vimy Ridge. The SS had a vicious reputation – they were Hitler’s personal army, they guarded him. And it was also their job to protect Vimy Ridge, not only from Allied armies but also from regular Wehrmacht soldiers who, rather understandably, might want to deface it. No one would defy the SS. Hitler’s plan was a great success. All the Australian war graves in France from World War I were destroyed in World War II. But the cemetery beside Vimy Ridge and the memorial itself remained untouched because the Waffen-SS did its job. The Vimy memorial stands there today, ready for this week’s ceremonies, mainly because the government of Canada has invested a great deal of money in repairing it. But the Vimy memorial is there at all because it was saved by its most infamous fan, Adolf Hitler. Sven Longshanks is joined by Alison Chabloz to talk about her court case, which is due to be heard Wednesday 7th March at Marylebone Magistrates Court, 181 Marylebone Rd, Marylebone, London, NW1 5BR. Supporters are welcome and are a big help in stopping the media from showing her in a bad light, as they will be unable to portray her as a lone voice that is out of step with the general public. The rendezvous point for supporters will be outside Marylebone Station, leaving for the court at 9am. Alison talks about her previous experience at the court, how the main prosecution witness had not even read the book which he was claiming to be defending. It will be Alison’s chance in the witness box this time, where she will be questioned by her own counsel and able to explain her reasons for writing a funny song about Jews who tell tall stories about the holohoax. The Campaign Against Anti-Semitism are hoping to get her music banned for being ‘grossly offensive’ as they can then claim that any revisionist investigation of the gas chambers fairy tale is ‘grossly offensive’ and get the truth-teller prosecuted. This would mean Britain had a de facto holocaust denial law through precedent. The question of whether or not posting a link to a file sharing site constitutes sending the material to a viewer will also be decided, but since you have to click to view anything, it is the viewer that is requesting the content be sent to them, not the person who uploaded it. A Freedom of Information request has revealed that the CAS have been trying to bribe the police with days out at the synagogue, dinner dates and all sorts of other offers in the hopes that they would lock her up and throw away the key. Since this document was made public, she has had her computer given back, there has been less police intimidation and the information will now form part of her defence. Turn on the Telefunken to listen . It would seem I received some very bad information, which I was told came from Susan Yarbrough, but she has reached out to this post and informed me of Gary’s dire circumstance. I offer my sincere apologies for my part in sharing the story of Gary’s death, but rest assured he will die soon without proper medical attention. He has aneurysms in his throat, his abdominal cavity is filled with tumors, he has cataracts so bad he can’t see. He is being denied a CPAP machine at ADX. They say they cannot have a CPAP machine there because it is a supermax facility, so they are just doing nothing to treat him. He also has Hemochromatosis, which he needs a bloodletting at least twice a month or his high iron levels could also kill him. He has lost 33 lbs in about a month, is to weak to get out of his bed, and is suffering. Gary Yarbrough has been in prison for 33 years, and even though he committed crimes none of them involved harming other human lives. In 2009, he was given a parole date of 2014. Then in 2010, that parole date was vacated on the grounds of “association.” This association was cited on posts made on public forums (Stormfront noted in the Notice of Action). At the time of this Notice of Action, Gary Yarbrough was in Florence ADX, which is a SuperMax without any internet access. Yarbrough is one of three members of The Order still in federal prison. The others, 66-year-old Randolph George Duey, and 70-year-old Richard Scutari, are scheduled for release from prison in 2043 and 2025, respectively.